On 15 September 2013, Greenpeace celebrated its 42nd anniversary. The organization, which was born in Vancouver in 1971, began life as a one-off campaign against US nuclear testing in the far North Pacific. For many, however, it is probably best known for its dramatic anti-whaling protests, the first of which took place in 1975 off the coast of California. What is perhaps less well-known, however, is that if it were not for one particular cetacean—a killer whale named Skana—Greenpeace may never have embarked on the campaign that helped virtually eliminate commercial whaling and made Greenpeace household name. 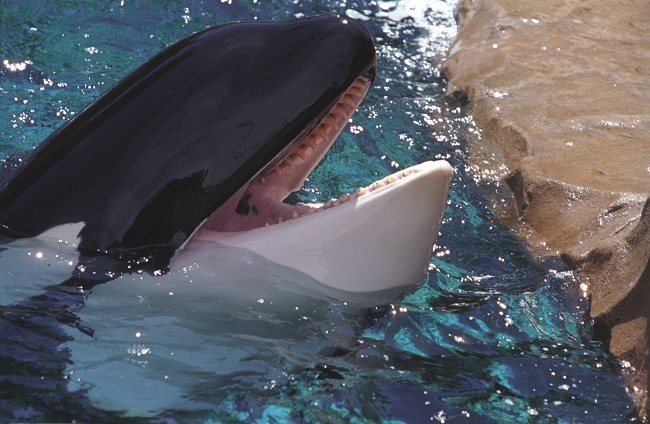 A killer whale (Orcinus orca) in Vancouver Aquarium, 1998. Photograph by Jerzy Strzelecki. CC 3.0 via Wikimedia Commons. Skana was born and raised in the sheltered waters of Puget Sound. She was six years old when her entire pod was captured in Yukon Harbor, Washington, on 15 February 1967. She was sold to the Vancouver Aquarium, where she soon met a young New Zealand scientist named Paul Spong. Spong had recently completed his PhD in neuroscience from the prestigious Brain Research Institute at UCLA and was working as a research scientist at the University of British Columbia. Spong had never worked with cetaceans and initially treated Skana much like a giant lab rat. His goal was to determine how much whales relied on their vision as opposed to their sonar. Over the next year, he conducted a series of experiments designed to test Skana’s visual acuity. He would place two cards in the water—one with a single line and one with two lines—and reward Skana whenever she chose the double-lined card. Gradually, Spong reduced the distance between the two lines until Skana could no longer distinguish between the two cards. At one-sixteenth of an inch, Skana’s rate of accuracy was 90 percent; at less then one-sixteenth, however, her success rate plummeted. Before publishing his results, Spong decided to repeat the experiment one last time at one-sixteenth of an inch. Much to his surprise, Skana not only failed the test but also managed to choose the wrong card eighty-three times in a row. It was clear to Spong that such a result could not occur by mere chance: that would be the equivalent of getting eighty-three tails from eight-three coin tosses. Skana, for whatever reason, was deliberately choosing the wrong card. At first, Spong became despondent with Skana’s conduct. His visual acuity data had been ruined, and Skana’s uncooperative behavior meant that she could not be trusted to perform further tests. Throughout the months he had been working with her, Spong had grown to enjoy Skana’s company, but he was still fearful of her size and power and continued to maintain an objective distance between himself and his subject. Now, he decided, it was time to abandon the formal experiments and simply spend time with Skana, observing her, interacting with her, and getting to know her better. One day as Spong was sitting at the edge of the pool with his feet dangling in the water, Skana approached him slowly, as she often did, before suddenly slashing her open mouth across his bare feet. Her four-inch teeth, which could easily have severed his feet like twigs from a branch, merely grazed his skin with a gentle caress. He immediately pulled his feet out, gasping in astonishment. In short time, however, his curiosity overcame his fear, and he gingerly lowered his legs back into the water. Skana again raked her teeth across the tops and soles of his feet, and once more Spong instinctively jerked them out of the water. He repeated the procedure eleven times with the same result. Then, on the twelfth, he became determined to restrain his urge to flinch. This time, Skana delicately clasped his motionless feet in her mouth, let them go, and swam away making what sounded like contented vocalizations. Spong left his feet in the water, but Skana did not approach them again. Bewildered and excited, Spong felt like he had just undergone a role reversal: Skana was now the experimenter, and he was her subject. At that point, according to Spong, he and Skana entered a “joyous period of mutual exploration”: “I dropped my posture of remoteness, opened my mind, and personally engaged myself in Skana’s learning. . . . This whale was no big brained rat or mouse. She was more like a person: inquisitive, inventive, joyous, gentle, joking, patient, and, above all, unafraid and exquisitely self-controlled.” Spong was soon convinced that cetaceans were in their own way as intelligent and emotionally sophisticated as humans and that hunting them was therefore akin to murder. Something had to be done to end the barbaric practice of whaling, but what? If there was one organization that was both radical and skilled enough to challenge the whalers on the high seas, it was Greenpeace. By 1974, they had organized several lengthy Pacific Ocean voyages as part of their protests against US and French nuclear testing. Happily for Spong, Greenpeace was based in Vancouver, and one of its leading activists, Bob Hunter, was a well-known hippie journalist writing for the city’s major newspaper, the Vancouver Sun. Spong, himself a devotee of the sixties counterculture, organized a meeting with Hunter, and the two hit it off immediately. Hunter had read some of the literature on whale intelligence and shared Spong’s outrage about whaling. However, he was skeptical about the possibility of convincing others within Greenpeace to redirect the organization’s attention from nuclear weapons to whales. In an effort to persuade Hunter to do his utmost to convince Greenpeace, Spong invited him to visit Skana. Within minutes of meeting her, Hunter was stroking her jaw and rubbing his head against hers. Then, as he was leaning out over the pool, Skana suddenly emerged from the water and took his head inside her mouth, holding it there for several seconds. “It was not possible for me to move a fraction of an inch,” Hunter recalled. For a hippie journalist steeped in the I Ching and Gestalt psychology, it was a life-changing experience. Hunter believed that Skana had intentionally revealed the path he should now follow. She had exposed his fear and illuminated the secret corners of his soul. He was now certain that whales represented a supreme form of power and intelligence rooted in oneness with nature, a state that humans, in their pathetic struggles to conquer the natural world, could never achieve. Hunter was now ready to mount an anti-whaling crusade. Initially, he was unable to persuade Greenpeace to embrace the cause. Nevertheless, he and Spong were both obsessed with the idea. They developed a strategy they thought might stop the whalers while also delivering images of the horrors of whaling into living rooms around the world. They would harass whaling ships in small inflatable motor boats and film the encounter. Within a few months, Spong and Hunter’s enthusiasm had become infectious, and the other members of Greenpeace agreed to mount a protest in 1975. And they have been doing it ever since. 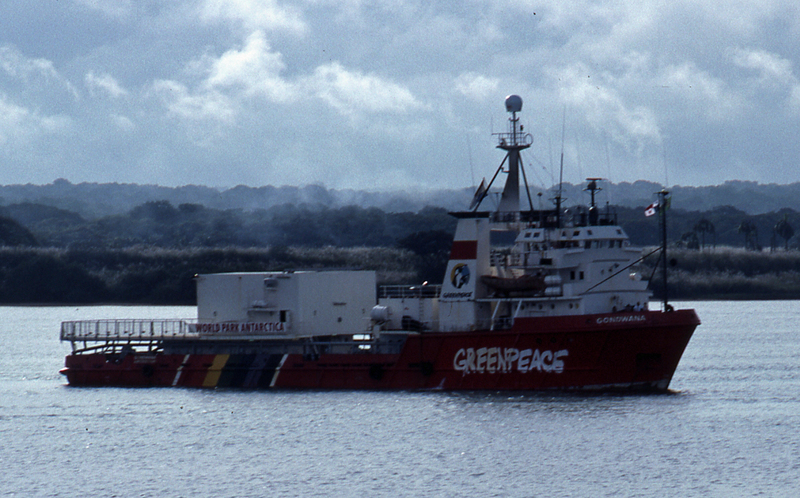 Greenpeace Ship Gondwana, 1990. Photograph by Monster4711. CC 3.0 via Wikimedia Commons. Whatever one might think of Greenpeace’s “Buddha of the deep” view of whales, there is no doubt that many whale species were—and some remain—close to extinction. Despite the success of the 1986 moratorium on commercial whaling, Japan continues to hunt whales under the guise of “scientific research.” Norway and Iceland don’t even bother to pretend that their whaling is anything other than commercial. The US Navy, meanwhile, has just released a report stating that it expects to kill hundreds of whales and dolphins as part of its bombing and mid-frequency sonar tests. Skana died in captivity in 1980. It seems unlikely that she had any idea of the impact that her relationship with Spong and Hunter had on Greenpeace and the world’s whalers. Nevertheless, anyone concerned about the fate of the world’s whales can’t help but wish that a few Japanese whalers and American admirals could have a close encounter with someone like Skana. Frank Zelko is Associate Professor of Environmental Studies and History at the University of Vermont. He is the author of Make it a Green Peace! : The Rise of Countercultural Environmentalism, which has just been published by OUP. One of the things that was forgotten in the book was about the Vancouver Boat Show of 1967. As a child, I can remember her being on display like a cat or turtle, with screaming, running kids around her tank (it was a small above ground human pool). My dad, Bill Rosie worked for Henns/Johnson Termainal Trucking Company. They had brought her there. And for my birthday, my dad took me there to see and meet her. You may contact me if you wish to. At the Email. I live in Yellowknife, NT now. And my dad has passed on.